– My husband, re: my blog, this blog, trying to be funny/encouraging and achieving 50% of his goal. Like, half of encouraging, and half of funny. 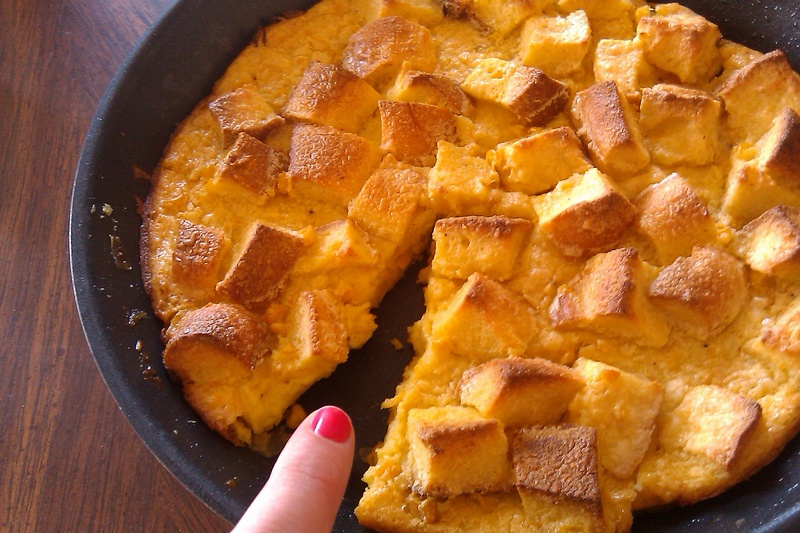 So…here is a new recipe! Sorry I failed you, internet. This will make you feel better. I’m no doctor, but, given any given illness this glorious Winter of ’15, this delightful spin on a classic has made me feel much, much better, if only because of the dueling warming effects of microwaved water and booze. Did I mention that my apartment has crap heating? I might as well just leave the windows open, it’s been so cold. 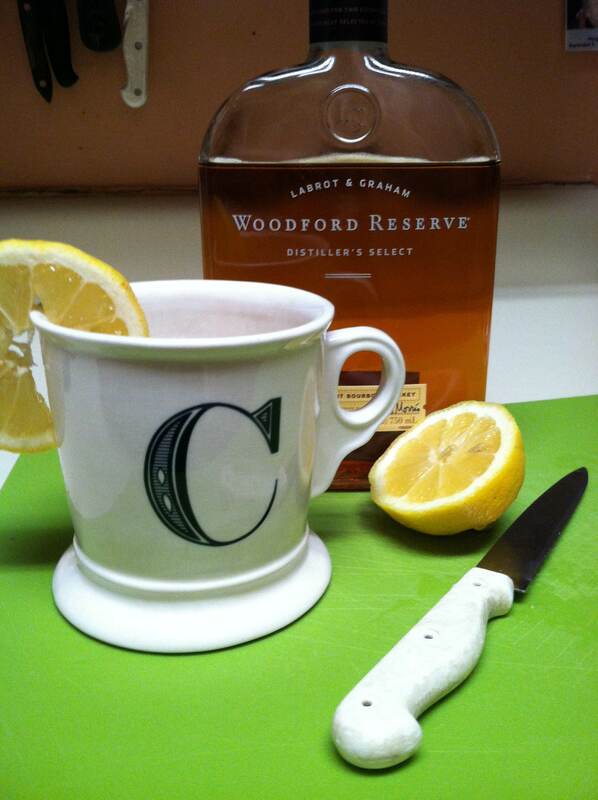 No matter, I have my friend Woodford to keep me company. Oh, and my encouraging husband, obvi. In all seriousness, this drink is a delight, and might have some benefits when you are sick (again though…not a doctor). Maple syrup contains a bunch of minerals including Zinc, which is recommended for fighting a cold. Then you got your Vitamin C from the lemon, so no, it’s not a health food, but it couldn’t hurt. I’ve seen versions with tea, but since I tend to want one of these bad boys right before bed, I omitted the tea. There are also variations with whole cloves, which would be lovely. Things to play with. Note also that proportions are to taste. I like this cocktail like I like my herbal tea, fairly sweet and sour. 1-2 tablespoons pure, real maple syrup. Mine is almost always from Vermont. Sorry, Canada. Mix. Drink. Fall in love with Winter all over again. Or, just know that it’s February, and you’re in the home stretch. Hello ya ol’ blog, and Happy New Year! It’s been a while. I have been cooking, but I have been really slow to post. 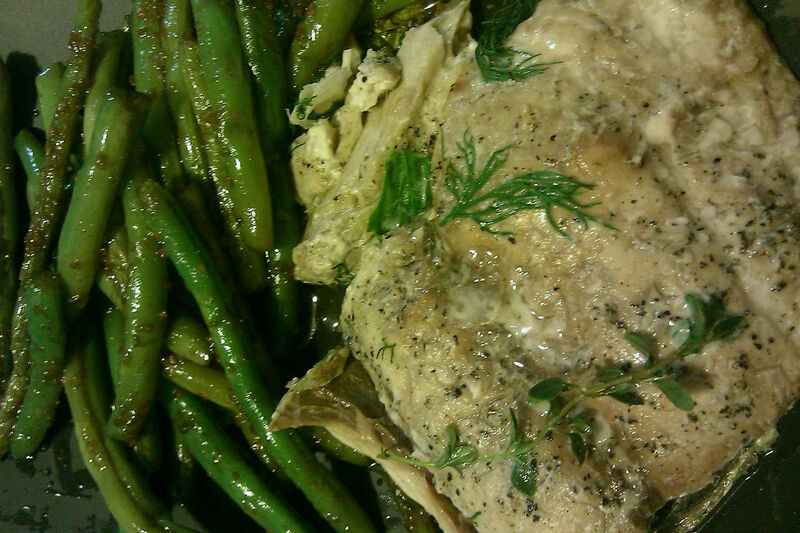 The truth is, I was using my cell phone to post pictures of the food I was making, but then it died. I am using a borrowed phone until my iPhone dreams come true (February 2012?? ), and the pics on my current phone just won’t cut it. But with the new year comes new ideas, and I am happy to present my first food review. While holiday shopping this year, I went to a store in Carroll Gardens called By Brooklyn. As the name implies, everything in the store is made in Brooklyn, my favorite borough, and there are many lovely things there, including food. I was looking for some stocking stuffers, and came upon my new favorite, albeit too-pricey-for-daily-consumption, confection. These caramels are a dream. Lending it an ever-so-slight bitterness, they are made using Brooklyn Brewery’s Brown Ale and East India Pale Ale, and crunchy bits of perfect pretzels from Martin’s Pretzels. 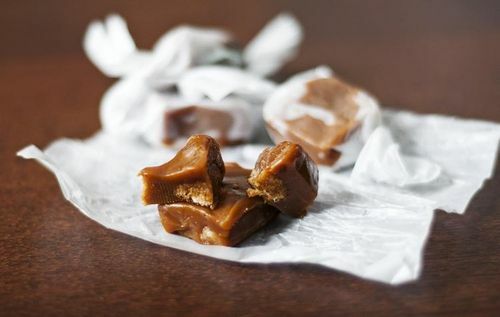 The caramel is soft and buttery, not the stick in your teeth and pull out a filling variety. It’s also not too sweet. The pretzels give the caramel that saltiness that is so fashionable and delicious, and the butter from the caramel seems to get sucked into the pretzel a bit, leaving the once hard pretzel to have more of a light, really satisfying crispiness. They run $7 for about 7 caramels, which makes them a bigger investment than a Sugar Daddy. As an occasional treat, I can totally justify the purchase. They also make a great stereotypical dude candy, since it’s a stereotypical dude quality to like beer, and they aren’t too girly. So for you, the stereotypical dude, or anyone in your life that likes quality sweets, I highly recommend these addictive caramels. You can get them at the Liddabit Sweets website, along with another favorite, their Pumpkin Pie bar (there’s pie crust IN the bar. What?!?!?). First of all, excuse the poor images taken on my borrowed blackberry. 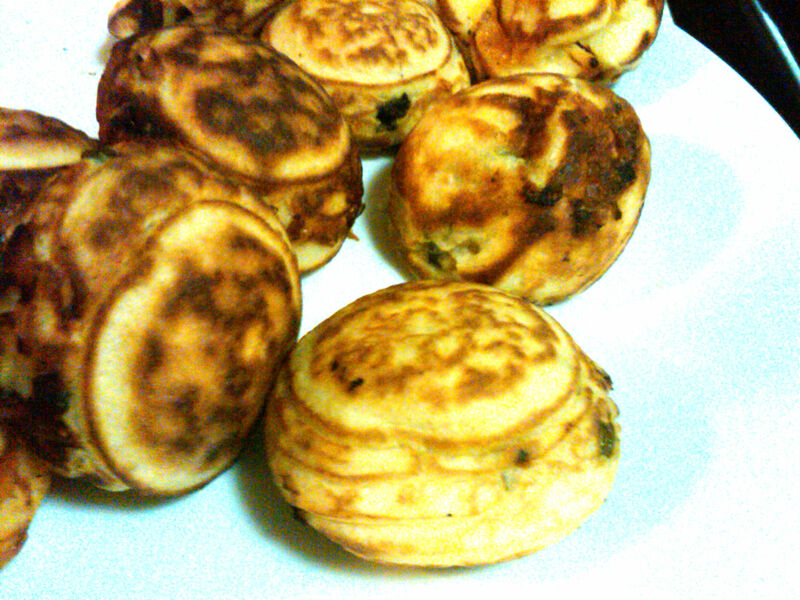 I couldn’t find my camera before we needed to gobble up these little pancake pillows from heaven. Second, WHY HAVE I WAITED SO LONG TO MAKE EBELSKIVER?!?! Æbleskiver (Danish meaning apple slices (singular: æbleskive)) are traditional Danish pancakes in a distinctive shape of a sphere. 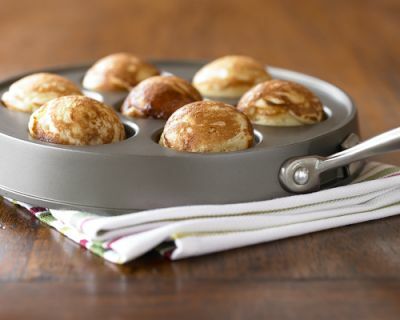 Somewhat similar in texture to American pancakes crossed with a popover, æbleskiver are solid like a pancake but light and fluffy like a popover. But since I needed to justify my purchase by making dinner with it, I needed to make savory ebelskiver, rather than the traditional apple-filled ones (although those will be next…). So a little research and a few random elements from my kitchen later, and voila! 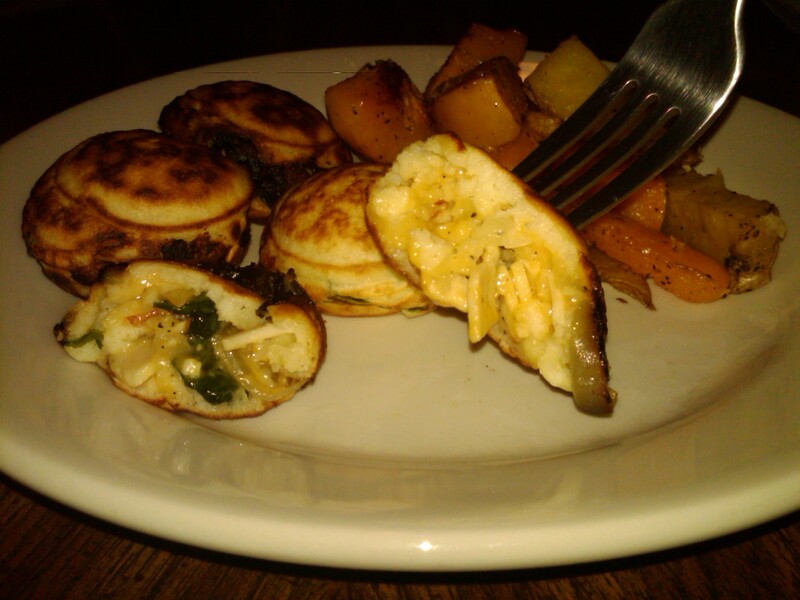 Pancake balls for dinner! Add the chicken and cook until heated through. Add the rosemary. Season with salt and pepper to taste. Once the mixture is cooled, stir in the cheese (you don’t want it to melt in the pan, I recommend making the filling first, and then after you make the batter, it should be cooled enough). In large bowl whisk together dry ingredients. In a small bowl whisk egg yolks, then in whisk in milk and butter. Add yolk mixture to flour mixture and stir till blended. It will be lumpy. I didn’t have skewers, so I used some mini-silicon spatulas. I also just used Pam to grease the pan, of course do that away from the flame of your stove top (no ebelskiver emergency room visits, please!). I also used a handy pancake batter squeezy bottle, also purchased at Target. These were just delightful. Future combinations will include a pear and apple compote with cinnamon sugar, nutella and bananas, and pizza-flavored, because I am a 12 year old boy. One Spring eve, my dad brought home what he thought would be an unappreciated addition to the family table – bluefish. My sister and I were both under the age of 10, and he assumed that we would turn up our noses and turn down our thumbs at this fatty, fishy-fish. My mom cooked it with garlic, ginger, green onions and soy sauce, and to their surprise, we gobbled it up, and wanted more. Bluefish is magical. It is dense and soft when cooked, and it holds its own against strong flavors (like my mom’s version). My personal favorite is smoked bluefish, which I have found at fish monger stands in NYC markets, usually around June. My sister and I would eat smoked bluefish like candy. We were a little weird, but it was damn good. A pound of the stuff would not last long at our house. I made this recipe for the fish, which I think came from a Real Simple recipe. As it was cooking, I got a hankering for my mom’s version, so I made some asian-inspired green beans to go along with it. It totally satiated my craving, and it was probably a healthier approach. Preheat the oven to 400°F for 15 minutes. Rinse the herbs and chop off their stems. Rub the fish with the vinegar and season with salt and pepper. 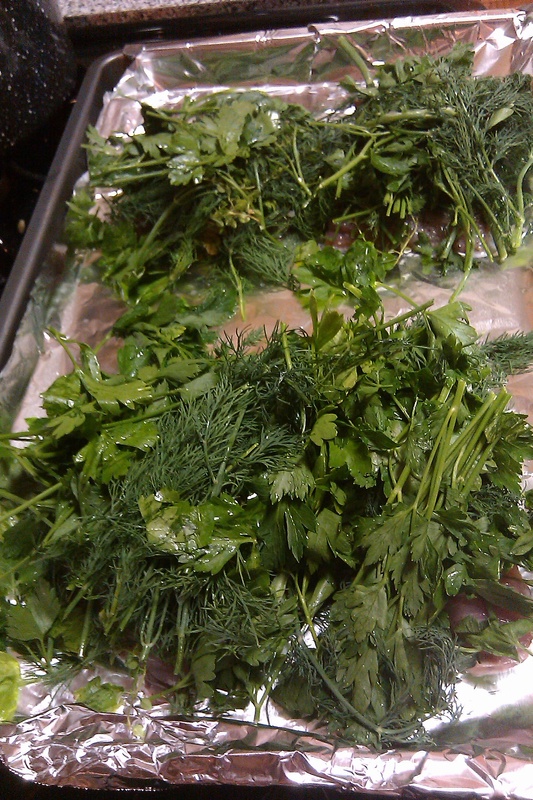 Set the fish in a foil-lined pan and cover with the herbs. Bake until the fish is cooked through, about 20 minutes. Discard the herbs before serving. In a large sauce pan, boil the water. Put the beans in the pan and steam, covered, about 5 minutes (or until cooked but still crisp). Mix the soy sauce, vinegar and sugar in a small bowl. Drain the beans, and set aside. Heat the oil in the dry pan, and saute the garlic and ginger about 1-2 minutes. Add the beans and soy sauce mixture, and cook, stirring frequently, for about 2 minutes. Drizzle with sesame oil. One fish, two fish, eat my bluefish. In any case, I usually trust an Alton Brown recipe, because there is science behind it, and Josie decided to trust him too. Josie made the right choice. Can’t blame the person who stole a slice. I would have. 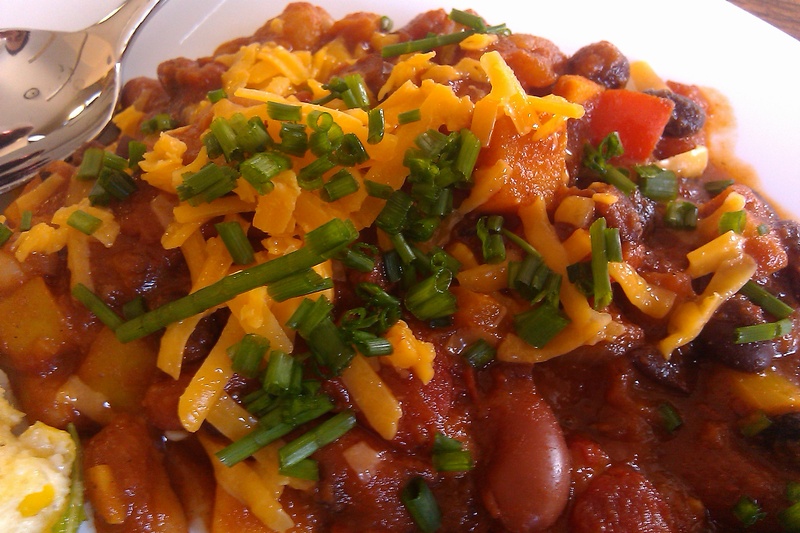 This chili is a staple at my dinner table. Modified from Joy of Cooking Vegetarian, it’s satisfying, healthy and cheap to make. Honestly, I’m not a huge meat-eater, and I usually lean towards vegetarian and often vegan foods. For my last cookbook club, I was responsible for the entree, and vowed that it would be a vegetarian offering. 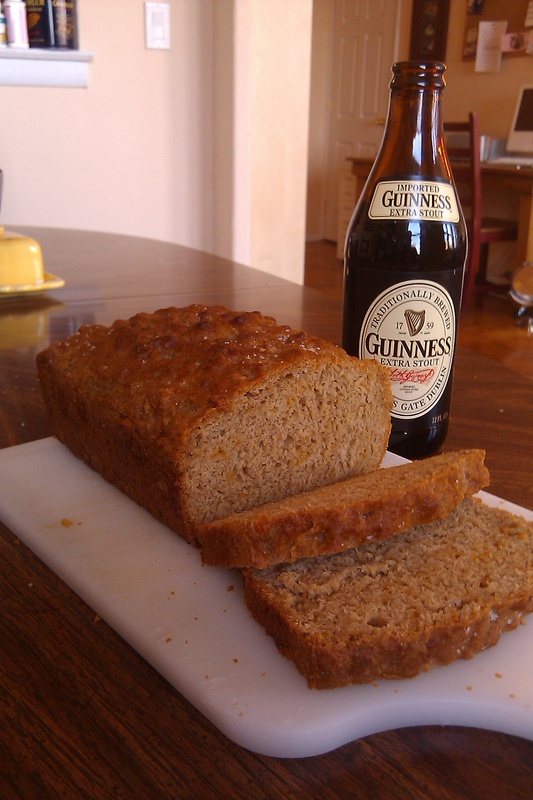 It was also the same week of my beer bread discovery, meaning I didn’t have the funds to make anything other than what I could with what I already had in my cupboard. 2 cups tomato juice, or 2 cups tomato puree with a little water, or 2 tablespoons tomato paste with 2 cups hot water. Add sweet potato, bell peppers, onions, and garlic. Cook, stirring, until the onions are golden, 12 to 15 minutes. Add chipotle pepper, chili powder, and cumin. Cook, stirring for 2 minutes. Stir in tomatoes, beans, tomato juice, and salt. Bring to a boil. Reduce the heat to medium-low and simmer, uncovered, stirring occasionally and adding more tomato juice or water if needed, until the flavors are blended, about 45 minutes. Taste and adjust the seasonings. Ladle into bowls and serve with sour cream, cheese, chopped cilantro or green onion. There was a week, recently, when the cupboards were bare, and the bank was account low. We were hungry, but needed to save our pennies for rent. How bloody sad is that? Well, we’re young, so we can be irresponsible. Thankfully, I have a few tricks up my sleeve, and with the help of my husband’s home-brewed beer, we had a delightful loaf of Beer Bread that night. Ah, bread. Feeding the peasant’s for ages with its fine, filling goodness. Ever since that pathetic night, I have been making beer bread pretty much once a week, with different flours, beers, and add-ins. It’s a very versatile recipe. The basic recipe is 3 cups of self-rising flour, (or use all-purpose flour, but add 4.5 teaspoons of baking powder and 1.5 teaspoons of salt), a 12oz bottle of beer, 1/3-1/2 cup of sugar (depending on how sweet you want it) and that’s pretty much it. My first and favorite loaf was with my husband’s beer. He made the Brooklyn Brew Shop’s Chocolate Maple Porter, but since we ran out, I have since made many other loaves, one notable one was with Blue Moon and lemon zest. The bread always comes out like a buttery biscuit kind of bread, and it’s so easy to make, that it’s hard not to make it over and over again until your 6-pack runs out. Below is my recipe for the loaf pictured above. I used Guinness since it was St. Patrick’s Day last week. It does make the bread a little bitter, which I liked. If you don’t dig that, use what you have! 3 tablespoons unsalted butter, melted. 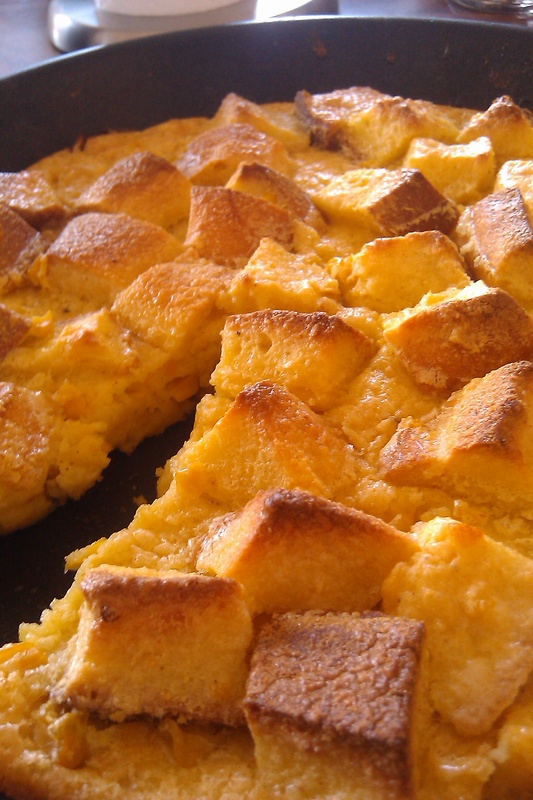 Mix flour, cornmeal, baking powder, salt, sugar and cheddar cheese. Add beer to the mixture, mix until combined, but don’t over mix. The dough will be sticky. Pour dough into a greased loaf pan, and bake for 50 minutes. Remove from oven, and pour melted butter over the loaf, and sprinkle with a little sea salt (this is optional, but I love the salt on the bread). Return to oven, and bake another 5 minutes. Allow to cool before slicing. Enter your email address to subscribe to this blog and receive notifications of new posts by email. How convenient!